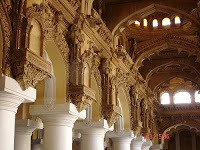 " Thirumalai nayakkar mahal" one of the beautiful palace in south India, "Thirumalai nayakkar" was built this marvelous palace. "Thirumalai nayakkar" succeeded his brother and crowned in 1634 A.D. In that time "Trichy" was the capital for nayak dynasty, "Thirumalai nayakkar" shifted the capital to "Madurai" because he was a devotee of "Lord Meenakshi". In that time, there are no palace in "Madurai". 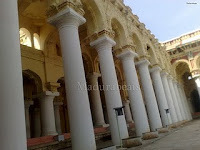 The old pandiya's palaces were already destroyed by the succeeded rulers, so "Thirumalai nayakkar " built a palace and that very palace is the "Thirumalai nayakkar mahal". At first "Thirumalai nayakkar Mahal" was four times bigger than today, There is an auditorium, adobe for queens("anthapuram") and houses for ministers in the palace. 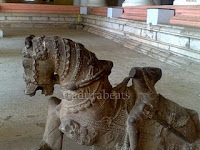 What we see today was "Kolu mandapam" which is a smaller part of the palace. Today's "pathu thoon" was an elephant shelter in the past, Today's "Panthadi theru" was a indoor play ground for royal women. In the British period, Thirumalai nayakkar mahal lost it's greatness and colonies built in the destroyed parts of the palace. In 1868 Madras Governor Mr. Napier saw the palace and decided to save the palace from destruction. He repaired the palace and that's what we have today. 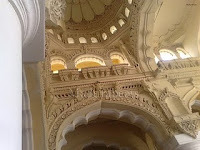 "Thirumalai nayakkar palace" not just beautiful but it's architecture. The palace have many arches between the pillars but the ancient architects never used a wood or steel to built the palace instead they used only hot bricks and mixture of calcium powder with sugarcane juice("sunnambu,Karumbu saru ") . There are 248 pillars in the palace now, all the pillars 58 feet in height and 16 feet in orbit . We cannot see like these pillars anywhere in India.